For me, like all England supporters, it did not come as a shock to wake on the morning of 6th January to discover that England had just received their second Ashes whitewash in seven years. The circumstances surrounding this one, however, are a little more difficult to fathom on the surface than they perhaps were in the winter of 2006/07 when Freddie Flintoff’s troubled travellers were pummelled by Ricky Ponting’s ageing side. Victors by 3-0 last summer many an England follower would have expected more of the same from their side this past winter. That this did not happen has already elicited a lengthy media post mortem with everything, as they say, coming out in the wash. The response to a beating of this magnitude is often as interesting as the reasons behind it and on this score England do, at least, have form. Besides two maulings in Australia in the past decade England have also suffered three other five Test series whitwashes in their history. The first came on Australian soil in 1920/21, while the other two came eighteen months apart, in 1984 and in 1985/86, against West Indies. How England responded on each previous occasion may just be instructive as to how they approach the future in this case, although, as Scyld Berry has already argued, the most prominent historical parallel to this winter’s tour came not during a series whitewash, but during a tour of Australia in 1958/59 when they only narrowly escaped that fate. A “Whitewash” can engender shock, recrimination and the determination to avoid its recurrence in equal measure. Johnny Douglas’s 1920 tourists experienced much of this almost a century ago, although the media aftershock, for very obvious reasons, was not as severe. The first Ashes tour of Australia by an English team after The Great War contained a team flush with batting talents of the magnitude of Frank Woolley, Jack Hobbs, Patsy Hendren and Wilfred Rhodes. In the days of timeless Tests, however, this stellar line-up only managed to compile an innings total in excess of 300 just three times, two of which came in the high scoring third Test in Adelaide where England posted scores of 447 and 370 and still lost. A serious lack of Test quality bowlers, plucked from a domestic game still reeling from the tragedy of war, meant that Warwick Armstrong’s home side plundered England’s seamers throughout the series. Back home in the summer of 1921 JWHT Douglas failed to stem the Aussie march toward yet another whitewash. After the second Test at Lord’s where the tourists had taken a 2-0 lead, Douglas was replaced as captain by Lord Tennyson for the third match at Leeds. The change in leadership failed to reap immediate rewards as England were trounced by 219 runs. A rain affected fourth encounter at Nottingham meant that England drew the game after showing some first innings resolve with a total of 362-4. The fifth Test at The Oval was Warwick Armstrong’s last and England once again drew the contest. Phil Mead struck an unbeaten 182 as England topped 400 in their first innings. Having lost 5-0 in the previous winter England looked like suffering the same fate on home soil in the summer of 1921. A change in captain and the temporary clearing of members of the old guard such the The Master, Jack Hobbs, at the top of the order, together with the impetus given by Mead and new blood such as Surrey’s Andy Sandham meant that England avoided a 5-0 mauling. Equally importantly, the weather, too, had played its part. In 1984 England’s thrashing by Clive Lloyd’s touring West Indies side is now seen as being synonomous with mid-decade Caribbean supremacy. In equal measure it is also associated with England’s depleted ranks following the South African exodus in 1981/82. The home side failed to post a single innings total of 400 throughout the series and, the Lord’s Test notwithstanding, never looked like challenging the tourists for any extended period of time. Allan Lamb’s three Test hundreds, Ian Botham’s best ever series against the West Indies and Chris Broad’s promising debut in the opening slot aside, there was precious little for England to cheer. David Gower was retained as England captain for that winter’s Indian tour, however, and the selectors were vindicated as the left-hander’s tourists came from behind to beat the home side 2-1. A mere eighteen months later and England could not blame inexperience and South Africa as an excuse to silence their detractors. With Gooch, Emburey and the likes of Les Taylor back on board, and with a batting line up comprising Gooch, Robinson, Gower, Lamb, Gatting, Botham and David Smith they were simply wiped out. Fumbling around in the aftershock of an unprecedented beating, bruised and bewildered, England were met with the uncomfortable reality that their best possible line-up had been pounded more spectacularly than the one which had faced Lloyd’s team in 1984. In their summation of the 1984 Edgbaston Test Wisden had acknowledged “the known disparity between the two teams”. A year and a half later and Gower’s England could no longer be viewed as a work in progress, but rather as the real thing with returning stars of world renown. In the following summer of 1986, David Gower was jettisoned as captain after the first Test against India, against whom England proceeded to lose the first home series of the summer. Picking up the baton Mike Gatting’s men then lost in the second half of the summer to New Zealand. Botham spent much of the summer serving a ban and, in the search of a regular opening partner for Gooch, Tim Robinson, Bill Athey, Martyn Moxon and Mark Benson each received an audition with varying degrees of success. Happy to escape the English summer Gatting’s men headed Down Under for an Ashes contest uncharitably dubbed “the wooden spoon” of international cricket. Serendipitously, things came together for England as Chris Broad came of age as a Test opener in Gooch’s absence. Once again, a change in leadership and that other vital ingredient, luck, had played their part in reversing England’s fortunes. 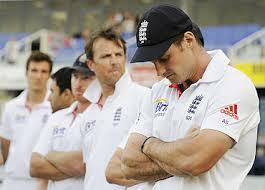 The 2006/07 debacle can best be understood in the context of England’s victory in the 2005 Ashes series. Regaining the urn for the first time in 18 years after a hard fought, thrilling series the England team were awarded MBEs en masse and were treated to a victory parade in Trafalgar Square. After that came a tour of Pakistan where coach Duncan Fletcher, mastermind of the previous summer’s victory, noticed a discernable change in the dressing room mood. A combination of misplaced triumphalism – perhaps understandable in the circumstances – and injuries to Vaughan, together with the stress induced return home of poor Marcus Trescothick, meant that England were thumped 5-0 in the return Ashes contest fourteen months later. Strike bowler Steve Harmison was plagued by self-doubt and lack of confidence and things went from bad to worse for England. Apart from a brief period of dominance during the Third Test in Adelaide England rarely competed and were outplayed by Ricky Ponting’s experienced team of champions, derided as a “Dad’s Army” of an outfit at the start of the series. for England, before Vaughan’s egocentric tendencies as captain eventually gave way to the Andrew Strauss regime and then, in 2009, a home Ashes win and the retirement of Andrew Flintoff. An interesting thesis, certainly, and what follows in the spring of 2014 and beyond as England surely rebuild is likely to be just as interesting. Certainly, new chief selector Paul Downton and his acolytes have much to ponder as they reconvene at NW8 in advance of the new English season.